My tribute to a legend. To a man who not only inspired me, but countless others. May your legacy live on, Stan Lee. I kinda expected Erma to be with the Avengers in mourning Stan. I thought he'd live forever. well..on the bright side, we can't say he never lived a full life. He was there at the beginning of comics, and saw decades of it's evolution first hand. Not many can say that about themselves. He left a huge impact on the legacy of comic books. This is an awesome tribute drawing! Even if Stan Lee should be dead, he'll always appear in the next Marvel movie. he was such a great person, the one who inspired all of us to make comic, and the real superhero. rest in peace Stan lee the legend. He brought a lot of happiness to this world. Truly he was a real superhero, who gave us the heroes we know and love today. Will never forget you Stan Lee, and thank you for the comics and movies of our favourite superheroes. romspaceknightart.blogspot.com… we sure could use those words of wisdom in today's climate. *puts hand on my heart and other on my back* may you rest in peace, creator of heros. Great tribute, RIP Stan Lee. NPCs Mock the Passing of Stan LeeWhat the actual F@#K! I will admit that I have not been reading/following western comics lately due to being a Japanese manga/anime reader/watcher. I will also admit that I have never met Stan Lee himself and therefore do no know him on a personal level. That said, I grew up reading my uncle's Marvel comics, including Spiderman, Ghost Rider, Thor, Hercules, Conan, The Fantactic Four, X-Men, Silver Surfer and the What If series. I am also a fan of both the Marvel Cinematic Universe and Boku no Hero Academia, both of which would NEVER come into being without the inspiration given by western comics written by Stan Lee! To all those NPCs/SJWs/Liberals/Progressives who follow the so-called code of "Political Correctness" to the point of actually mocking Stan Lee, when was the last bloody time when any of you wrote/made a work of fiction which the "average person" actually liked? From what little I know by lurking around Youtube, I am going to assume that the answer is, "Hardly Ever!" He may have passed, but the legacy he created, with his bare hands. Will live on. I play a WWII WARGAME CALLED FLAMES OF WAR.And I have several tanks that look as follows. is this spam or just sad? 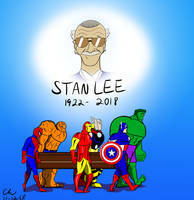 I like your logopic pretty cool.I been on this website for years and still don't know how some of it works.I'm just offering my condolencess in mouring STAN LEE.He was on a zillon. Stan Lee, this is not the end. New heroes will rise and legends like you will always be remembered. A wonderful tribute to a wonderful creator. You forgot to put Black Widow and Hawkeye there. Thanks mr. Outkast. It's very nice. Did you just call me mr. Outkast? I'm KevinSolano. sorry about that parently my comment went to the wrong box. I'd like to think that right now he's either partying it up in Asgard or cruising the galaxy with the Silver Surfer. This is a great tribute to a legend like Stan Lee.